For relief carving on wood or linoleum. Forged, heat-treated steel blades, smoothly finished palm-grip wooden handles. 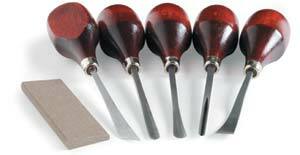 6-piece set includes knife, chisel, gouge, shallow U gouge, veiner, and sharpening stone.